The owner of a house near the UK base of security agency GCHQ, where British street artist Banksy painted a now-famous mural depicting spies, has described how his life “unraveled” after it appeared. Speaking publicly for the first time, David Possee, of Cheltenham, said he liked the mural when he first saw it painted on a house he was renting out. Possee, 45, told community radio station Swindon 105.5 that the local council should buy the building from him if they want to keep the artwork. 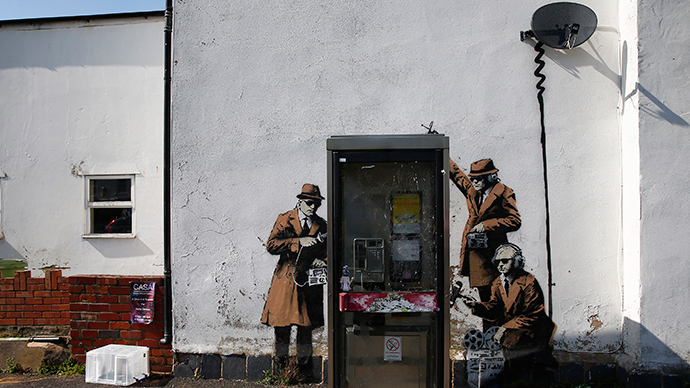 Banksy’s painting satirizing the illegal spying of intelligence agency GCHQ appeared in April 2014. The mural followed Edward Snowden’s revelations which showed British and American spies were able to monitor ordinary citizens through the internet. While Possee said he thought it was “quite nice” when he first saw it, the mural quickly became a headache. Possee has criticized Cheltenham Borough Council for expecting him to repair the cement render on the wall of his Grade-2 listed house, but then preventing him from removing it after the mural was also granted listed status. “We had the scaffolding up and then we had a huge panic in Cheltenham thinking I was going to cut it out, which was not the case,” he said. He accused the local council of not including him in discussions about the mural. “They weren’t working closely at all with me,” he said. Possee has shied away from speaking publicly about the painting, preferring to go through intermediaries such as his business partner, Roger Wilson, or art dealer Robin Barton. During the interview, he hit back at those who suspected him of trying to sell the artwork. “If Cheltenham wants it, Cheltenham can have it. But I need to get on with my own life. So buy the building off me,” he said. Martin Chandler, a team leader of development management at Cheltenham Borough Council, denied that the council was being unhelpful.